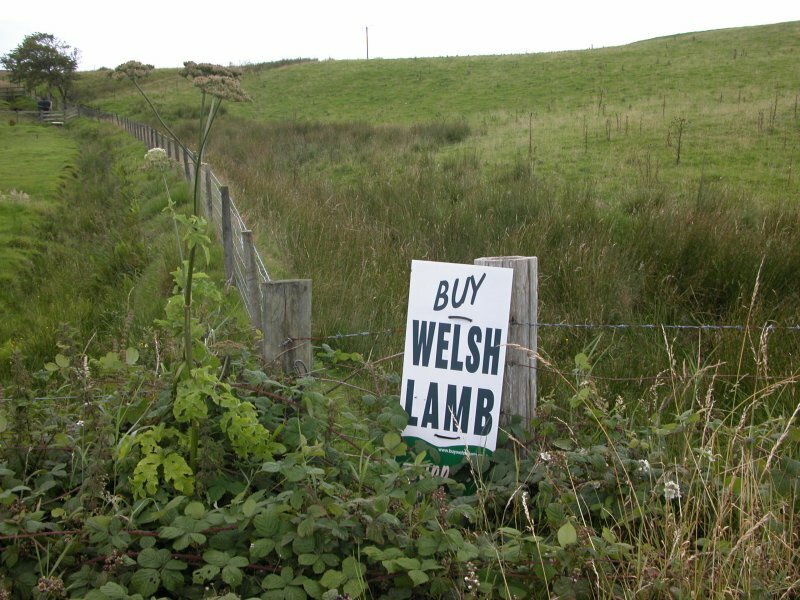 This was a weekend trip to see part of Wales that neither of us had visited before. 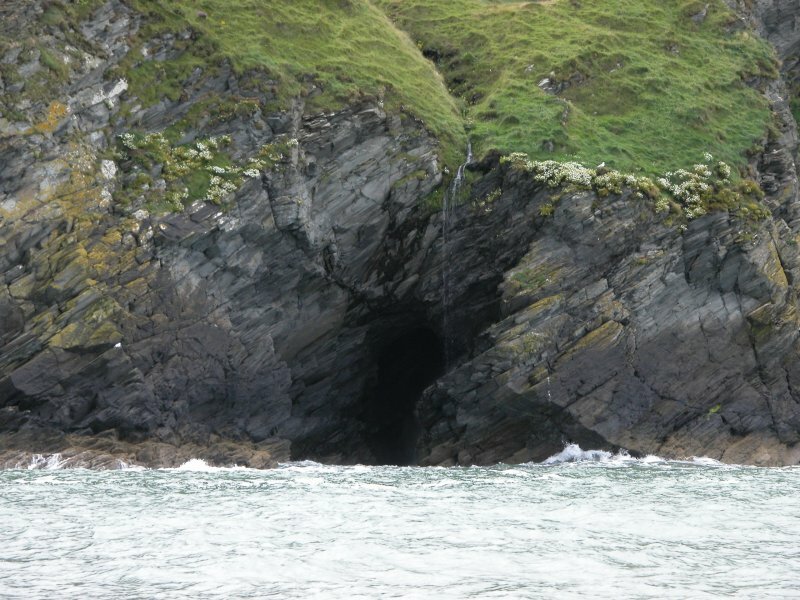 The first part is a famous set of waterfalls at a tiny village called Devil's Bridge/Pontarfynach, the second part is home to wild dolphins on the West Wales cost. It turned out to be a very productive trip, with many excellent pictures (not so many of dolphins). 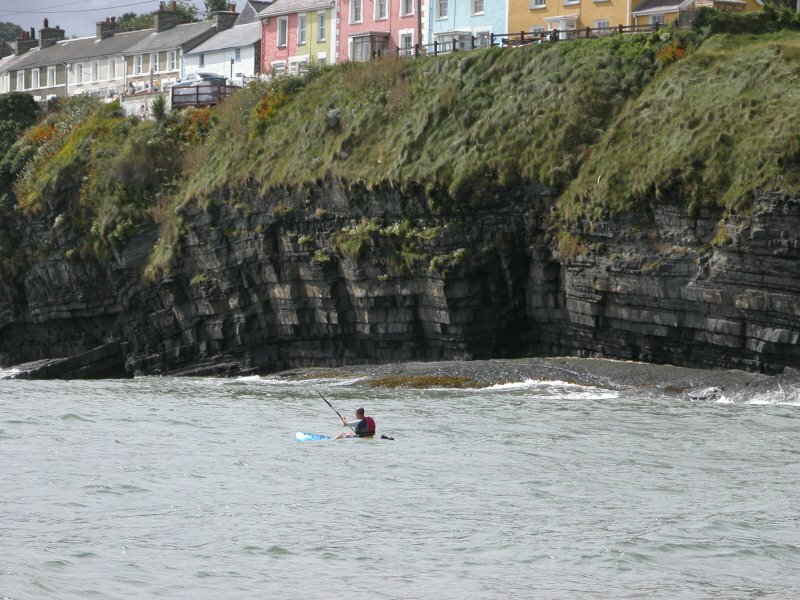 Mid Wales is relatively flat, sandwiched between Snowdonia to the north, and the Brecon Beacons to the south. 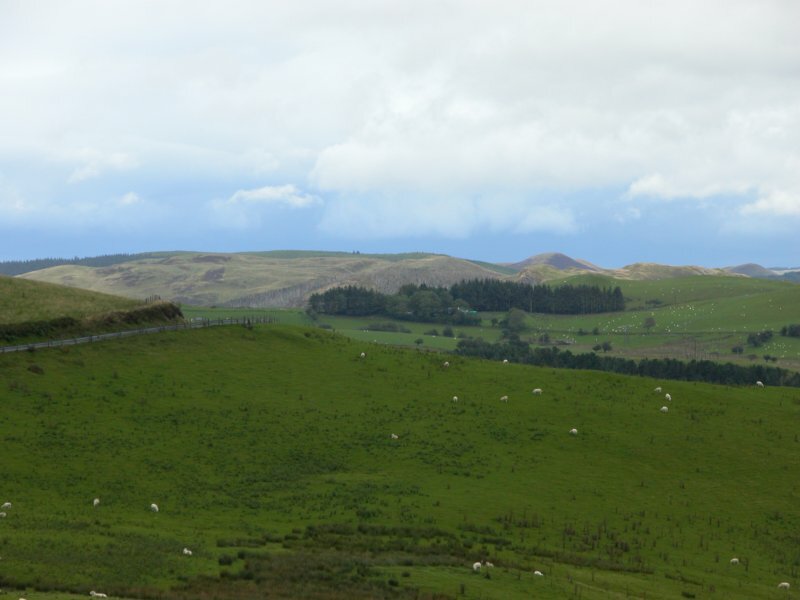 Nonetheless, it does have a range of hills (the Cambrian Mountains) running all the way down it, mostly used for sheep grazing. 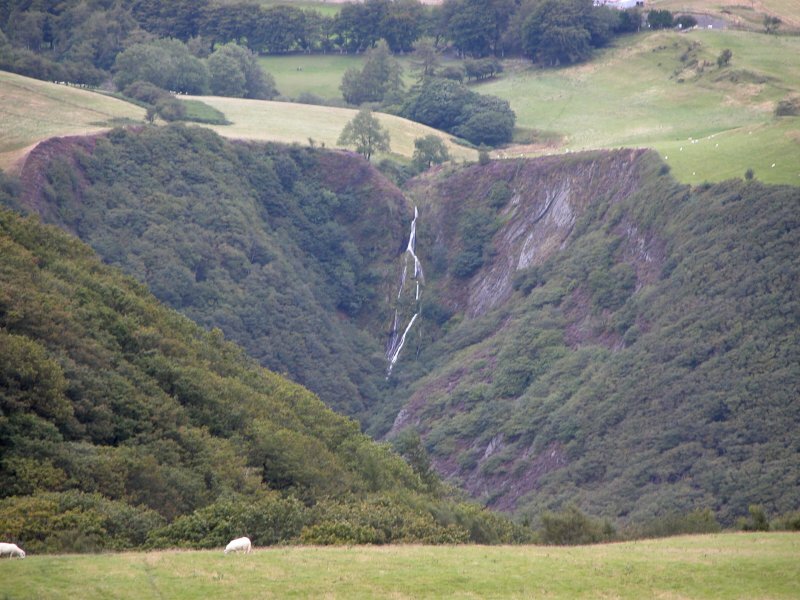 This part is the first that made me want to stop and get out the camera, the Afon Castell valley. 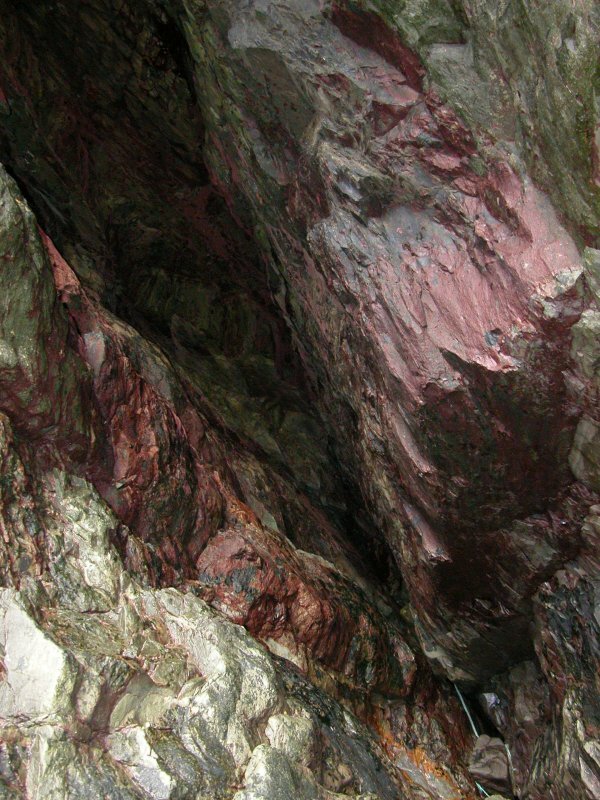 Note for geologists; the rock is Silurian Llandovery Group (conglomerates, sandstones and slaty beds, apparently). 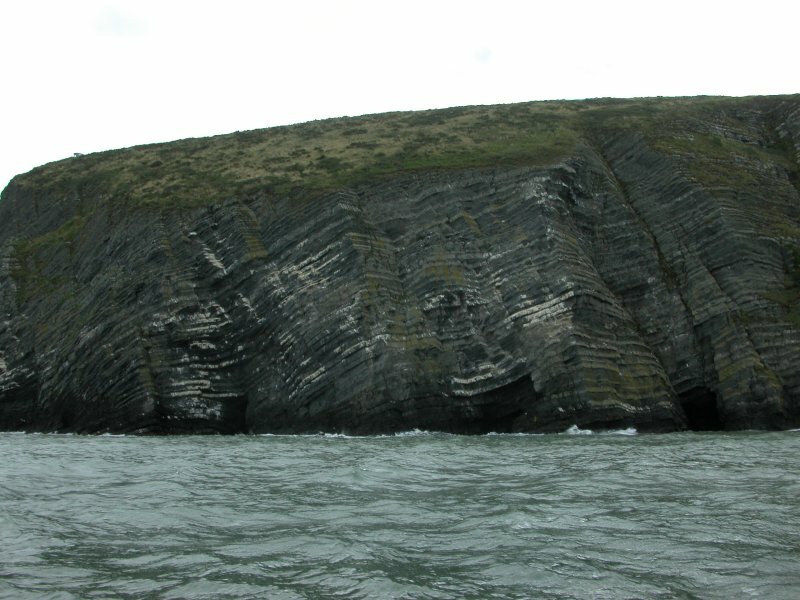 The Cambrian groups, the defining strata of the Cambrian period, are further north in Snowdonia, and the defining strata of the Precambrian supereon are further northeast. 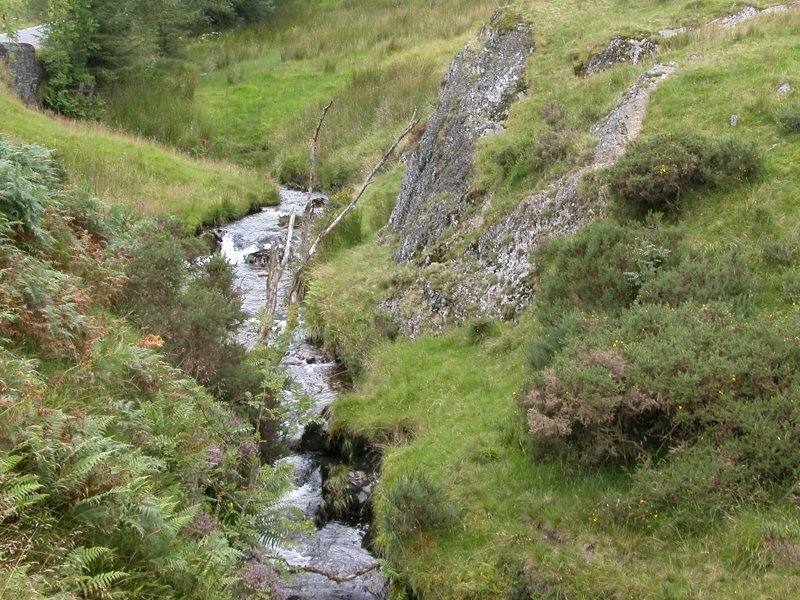 Up in the hills, the wide Afon Mynach suddenly plunges into a narrow gully that looks disturbingly like limestone (my low-resolution geological map still only shows Silurian, but the rock is apparently sandstones and shales). 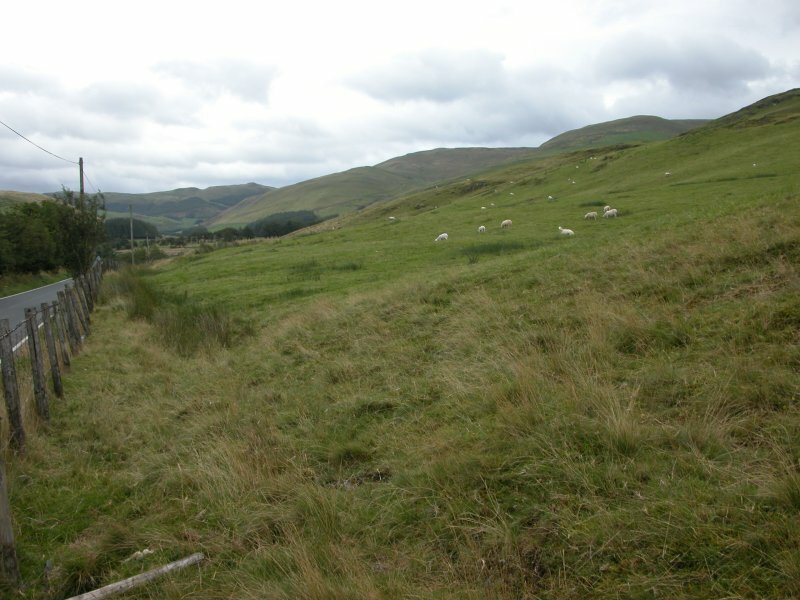 The mynach begins around Pen y Garn, 610 metres. 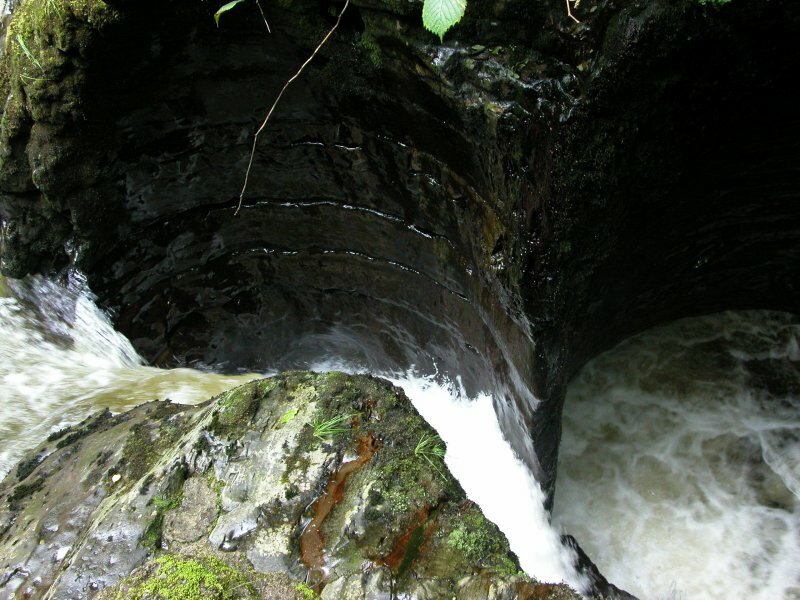 A series of small cascades and deep plungepools mark the Devil's Punchbowl. Sadly, this area is not in a national park, is not public access land, and does not have a public right of way. 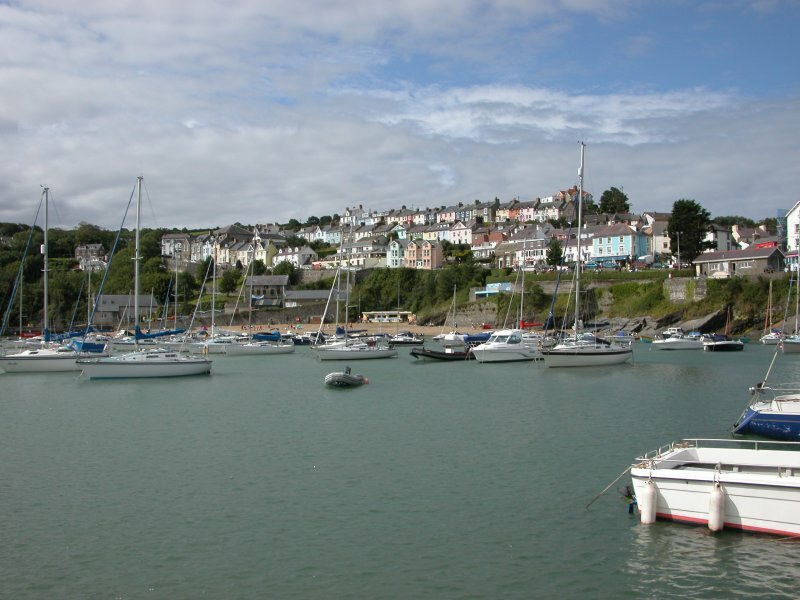 Visiting costs £1 per person. 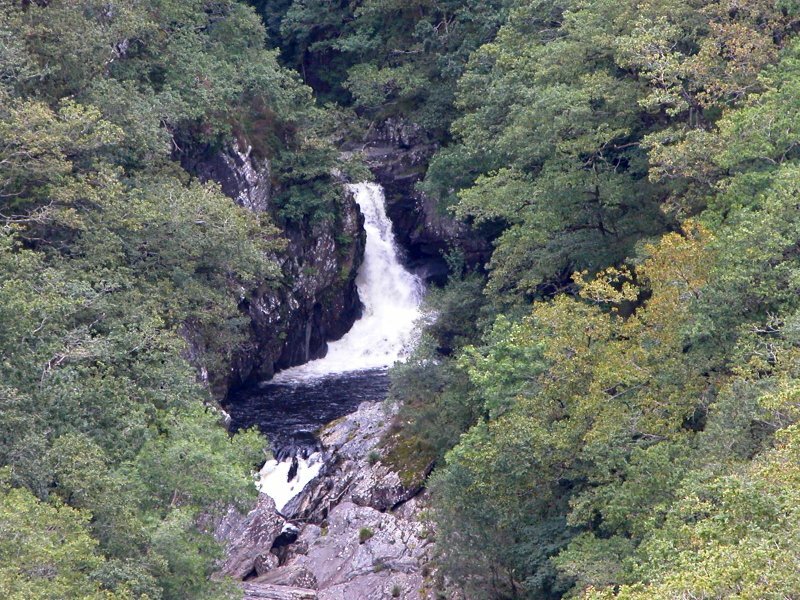 Access is controlled by a company called Devil's Bridge Falls/Rhaeadrau Pontarfynach, but note that this name belongs only to the company - the waterfalls have their own names. Where the river charges into a ridiculously narrow rift. 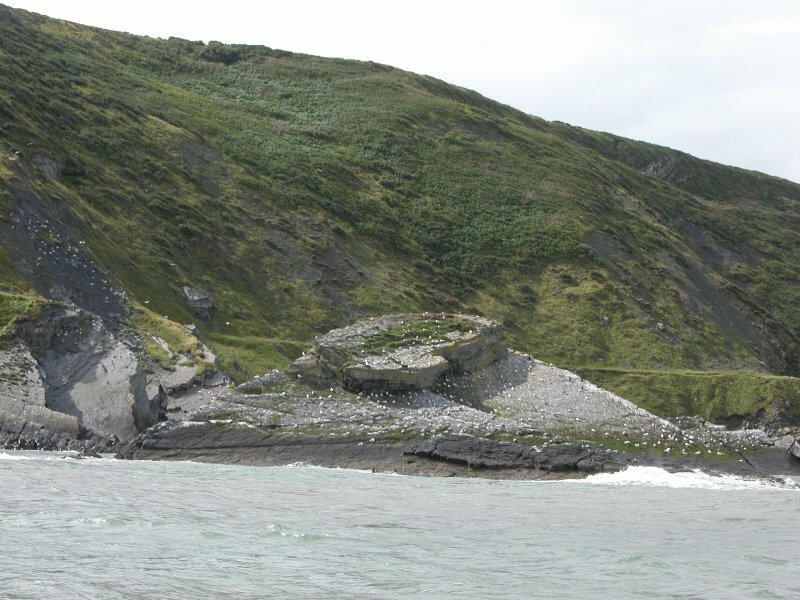 Above the rift are the three bridges, dating from about 1000, 1708 and 1901 respectively. 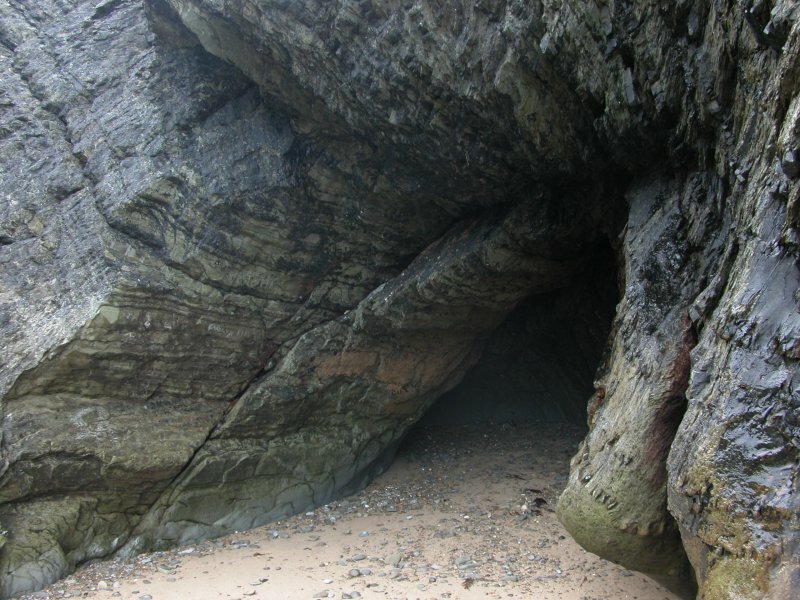 The lowest one has a silly legend about being too hard to be built by humans, so it was built by the Devil (to let an old woman collect her cow) for the cost of the soul of the first life to cross it. He was tricked, as a dog was sent across first. 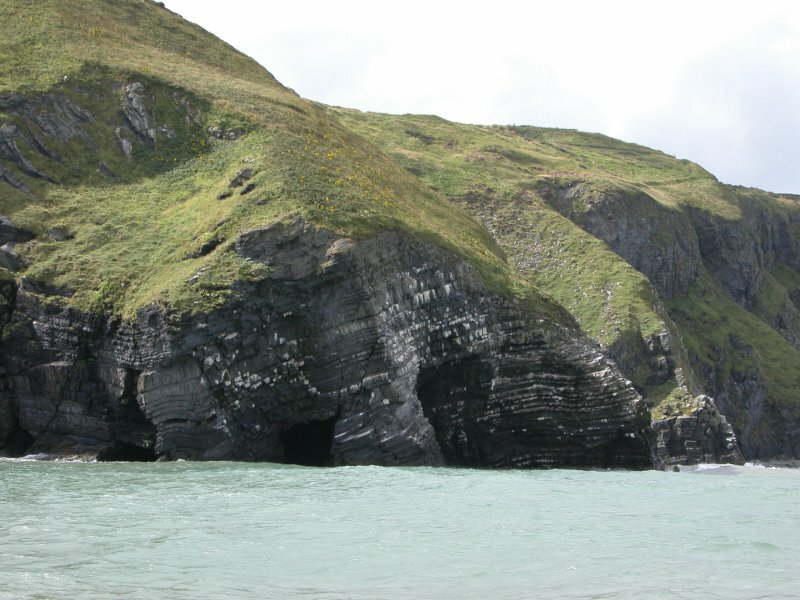 Anyway, it's a stupid legend, not least because it was built by monks (Devilish monks, perhaps), but also because it's such a narrow rift, it would be easy to build a bridge across it, even in the 11th century. A plank would be sufficient. 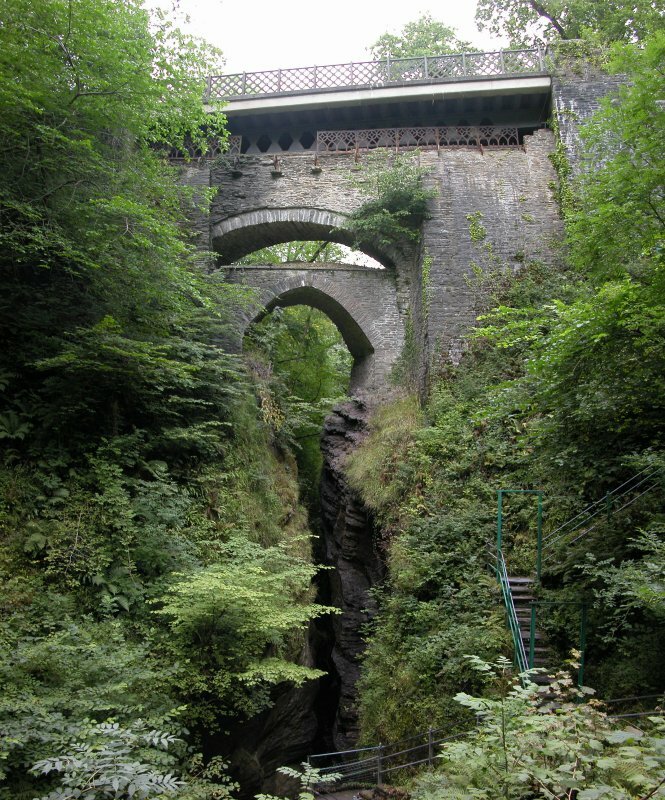 On the other side of the bridge, the river plunges down the Mynach Falls. 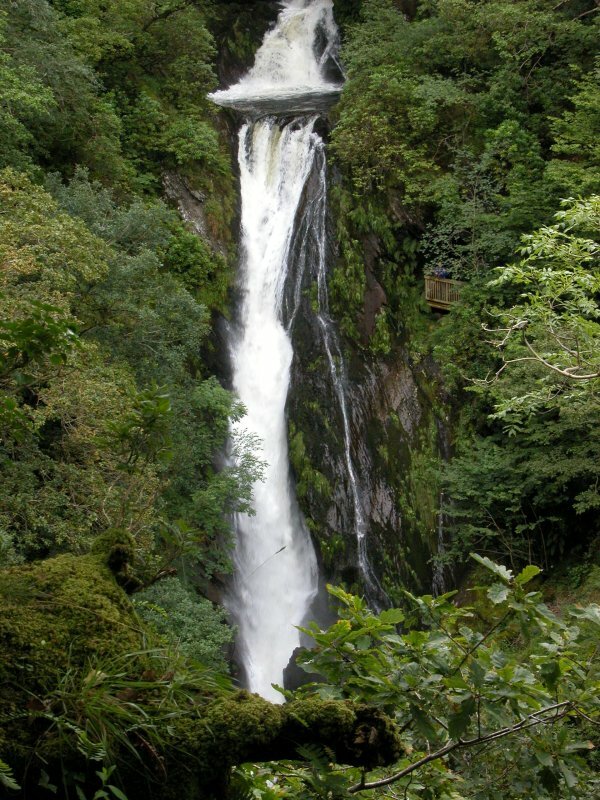 The total height from top to bottom is 90 metres, made up from 5 main waterfalls (the upper 4 of which can be seen here), several smaller cascades, and a steeply sloping river. 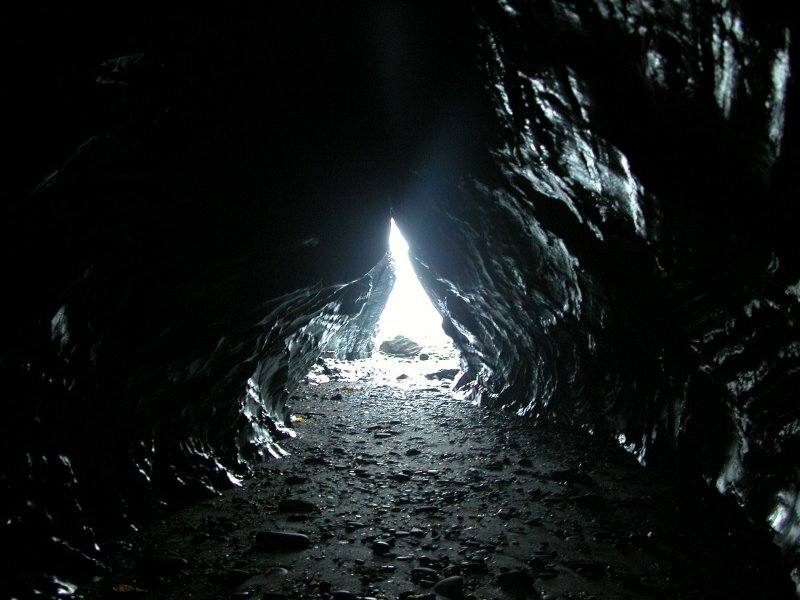 The only way to see these properly is from the private footpath (also operated by the Devil's Bridge Falls/Rhaeadrau Pontarfynach company) that costs £3.50 per person at the time of writing. Even so, little work is done to keep the foliage out of the way of the main viewpoints, so the views are constantly blocked by trees. Several of the following photographs were taken while balanced in silly positions on fences. 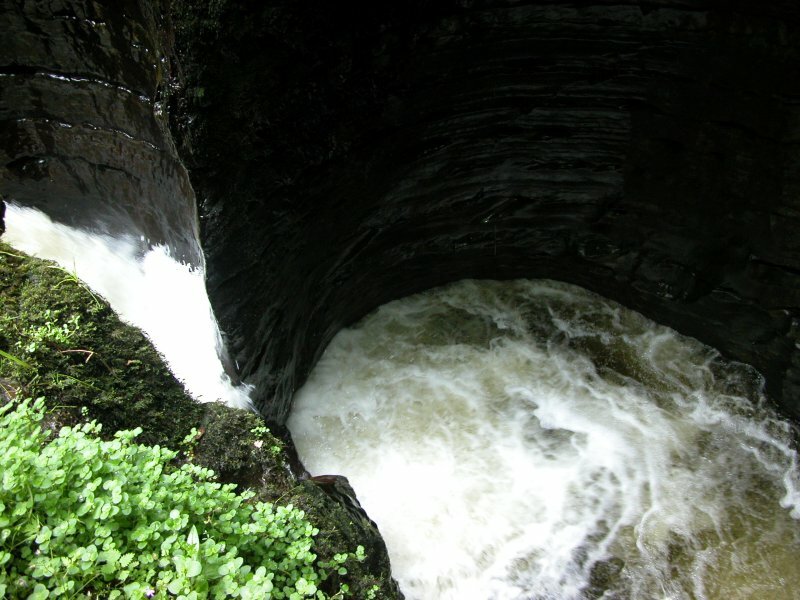 The upper waterfall. Excuse the silly red kite sculpture, it's not a real bird. 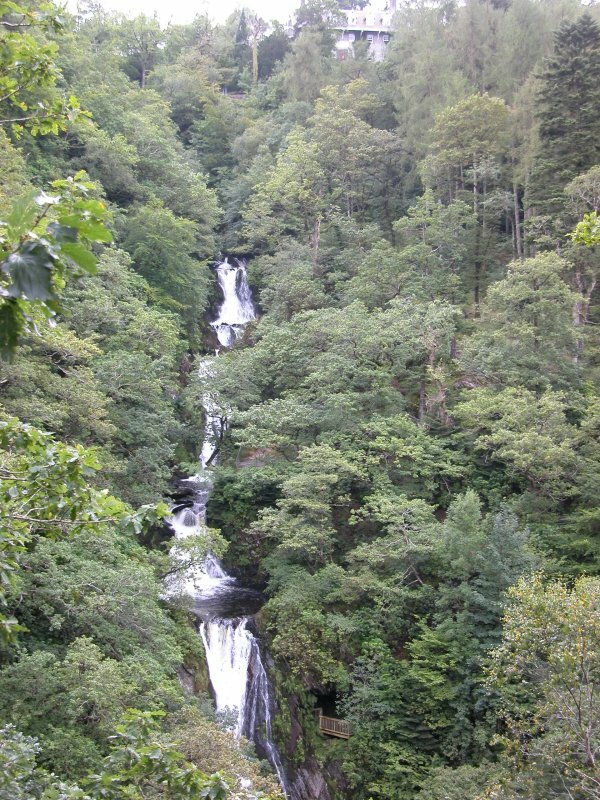 The third waterfall, only a little more than a cascade, but pretty anyway. 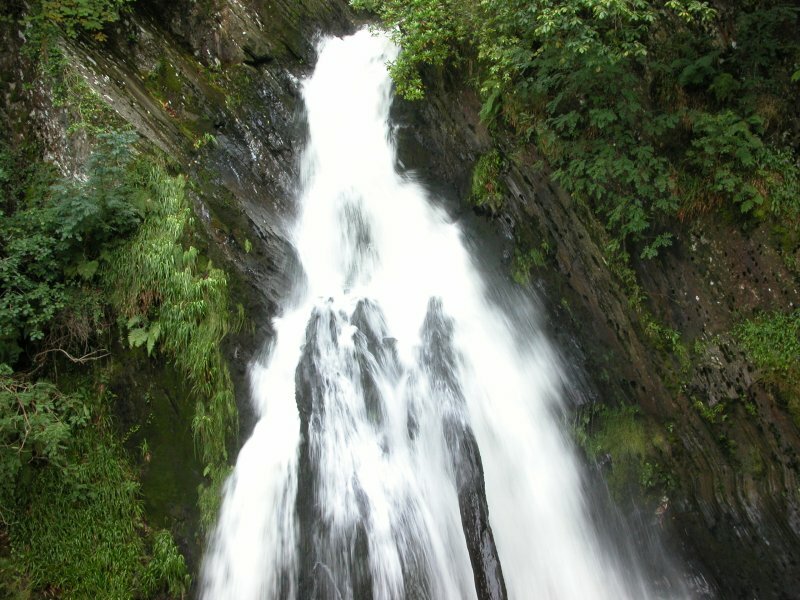 The main fall, much taller than the others (estimated around 25 metres - based on heights of humans in some shots), and very graceful. 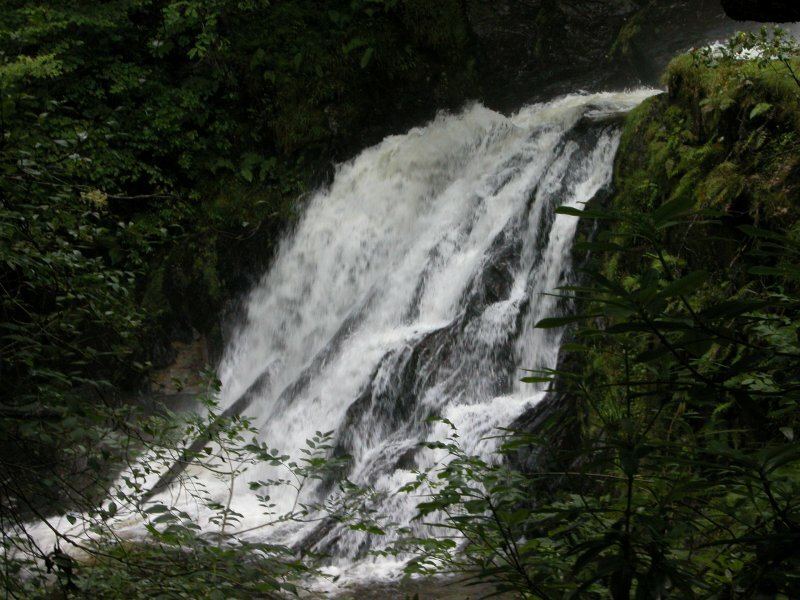 The outflow from the main waterfall cascades down the last waterfall, where the Afon Mynach charges off to join the Afon Rheidol. 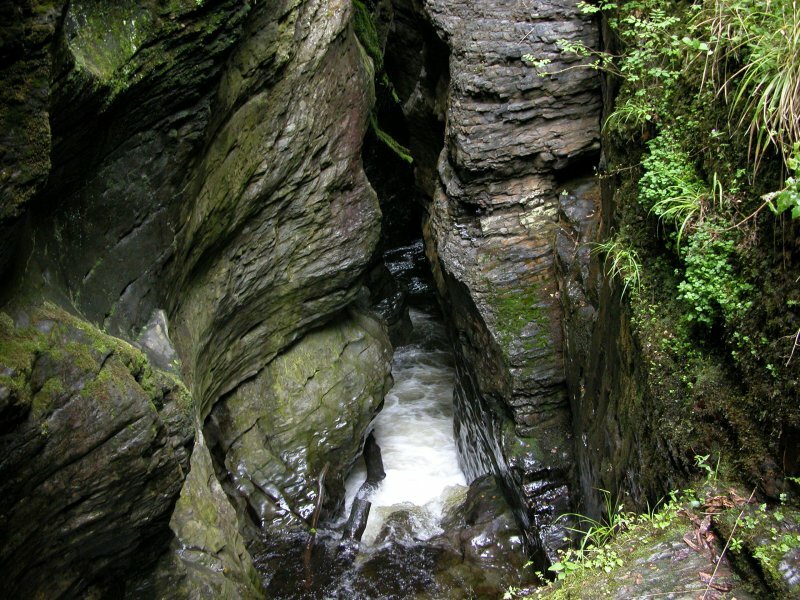 The Afon Rheidol, flowing in its deep gorge. 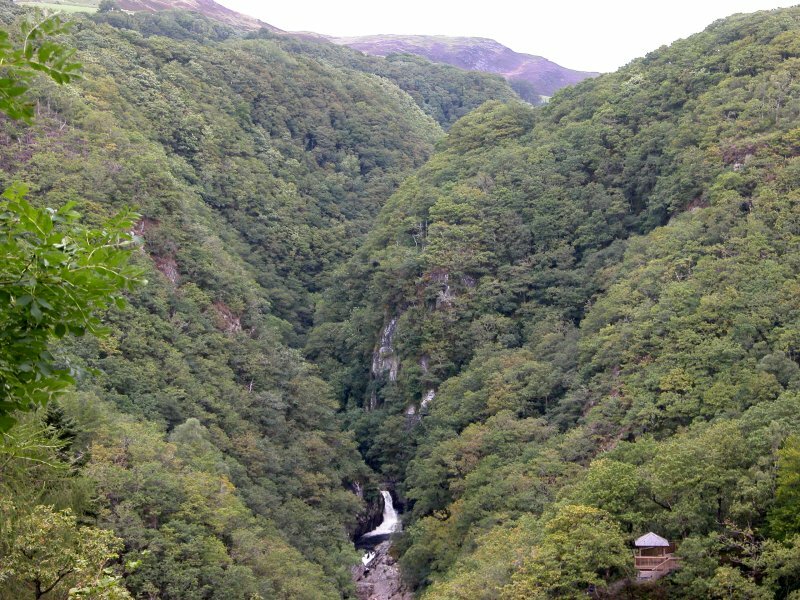 The hut on the right is the main viewpoint for the first Mynach Falls picture. 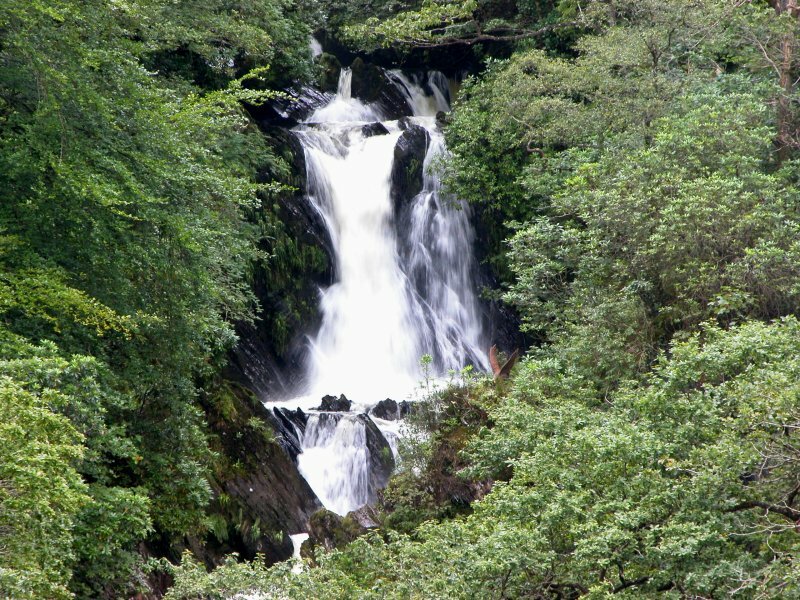 Gyfarllwyd Falls on the Afon Rheidol. The hills of Banc Trawsnant, I think. Highest point is 407 metres. 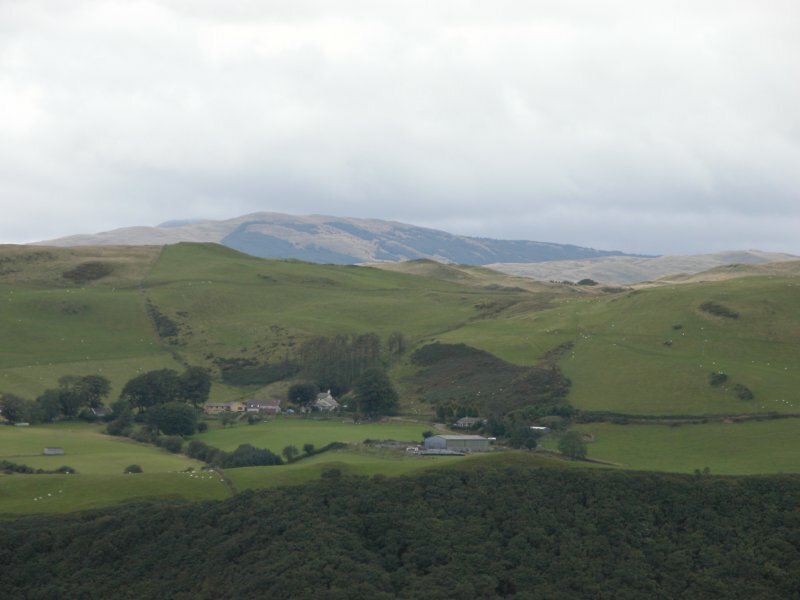 This area is the highest in Mid Wales, with this particular massif, Pumlumon, holding all the Mid Wales records, with the only summits over 700 metres. The heights of the peaks are 752, 741 and 727 metres. The major rivers Severn and Wye both start on this massif. 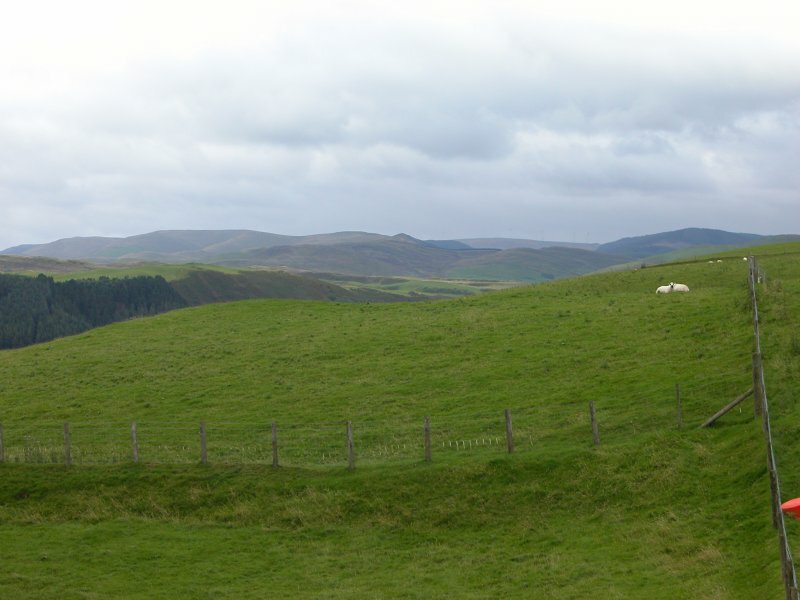 One last look at the surrounding hills. 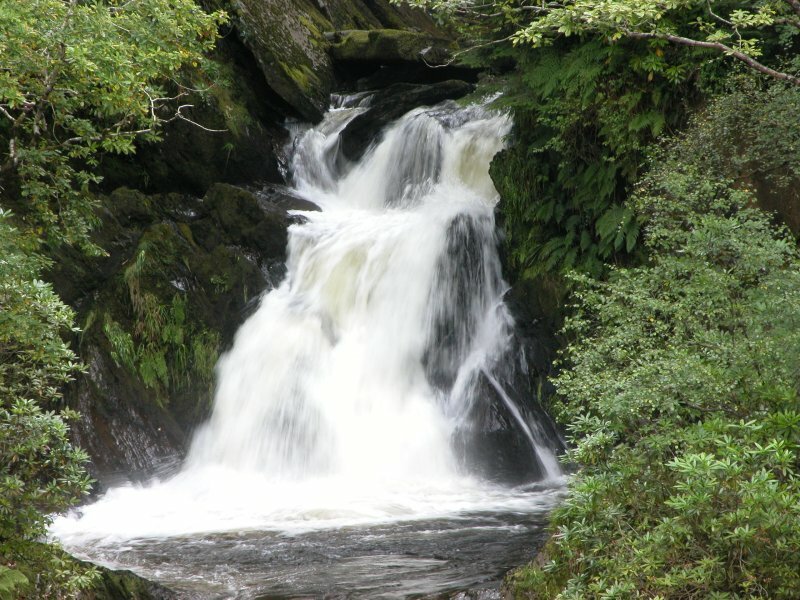 Above the Rheidol Falls (not very high, but lots of water), is Bwa-drain, with its own little waterfalls. A subtle hint left hidden by the side of the road, to be seen only by those who stop to take pictures. 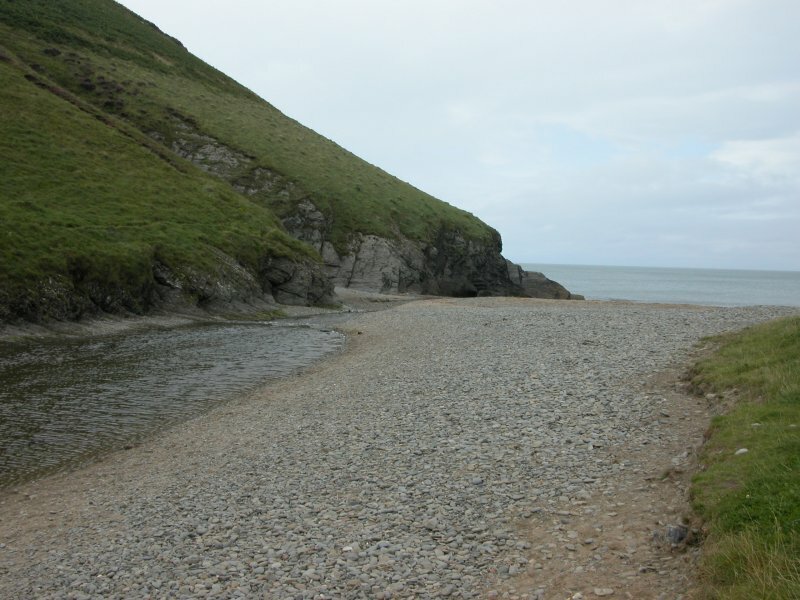 After a drive down the coast on the meagre roads that service the area, is Cwmtudu, where the Afon Ffynnon Ddewi reaches the sea. 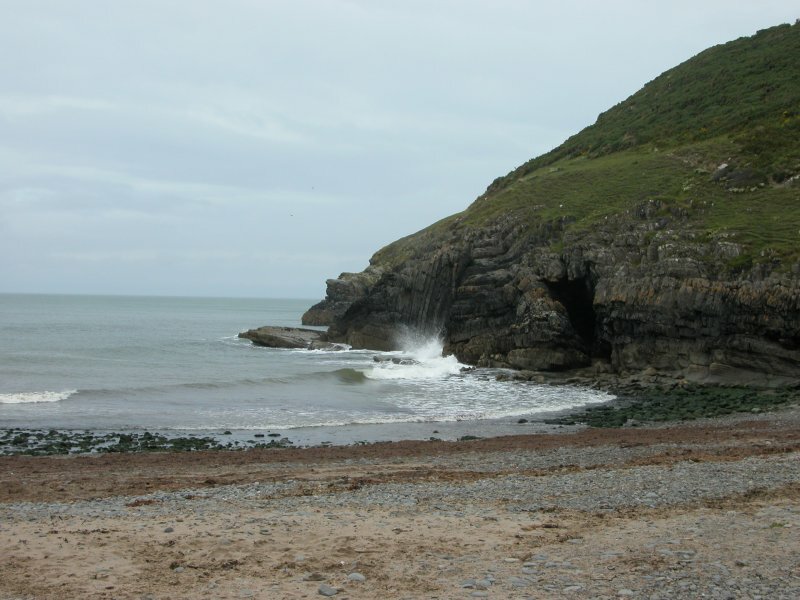 Cwmtudu Bay, that likes to think it is well known as a smugglers' cove. Simply by your reading this, the number of people who know about it has doubled. 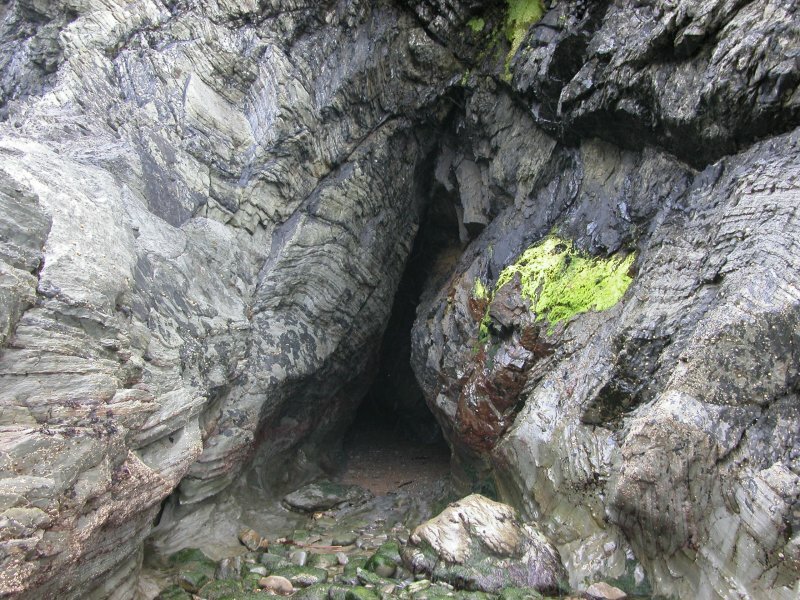 One of the Craig Caerllan Caves - the smuggler's caves. 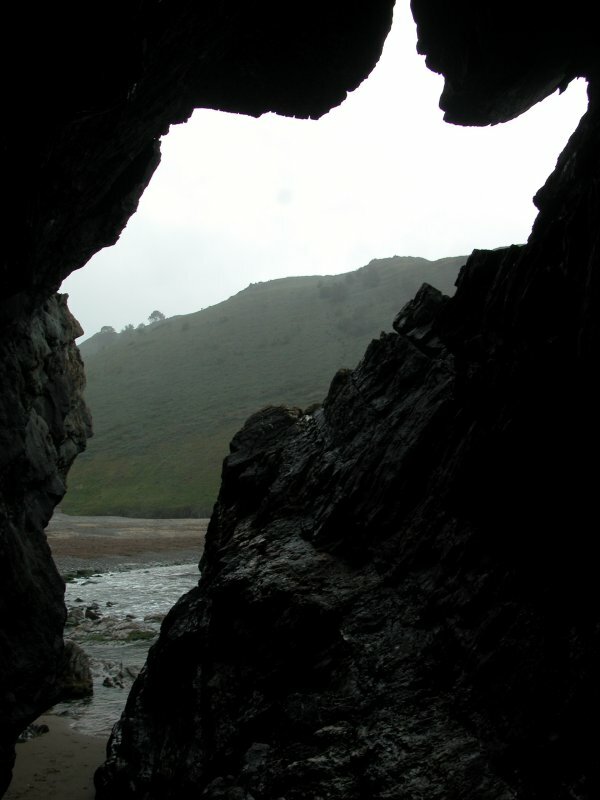 Inside the longer sea cave. 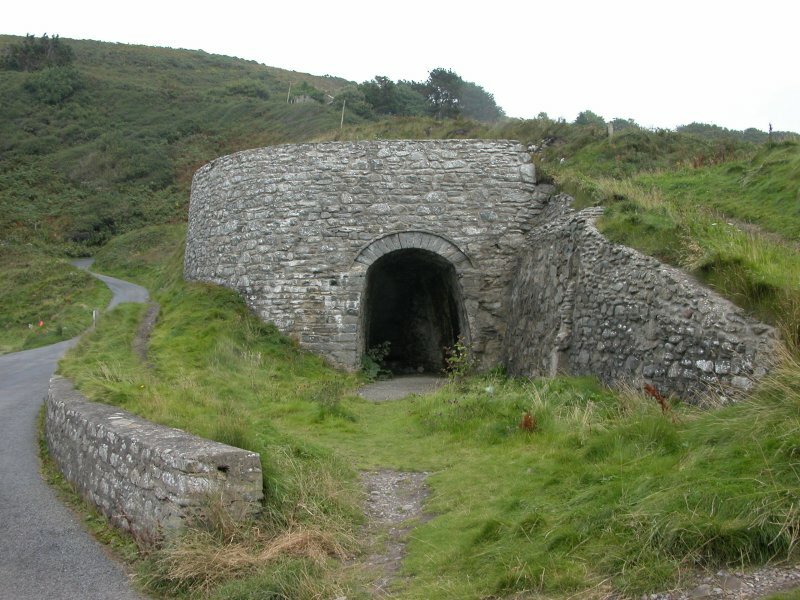 Well preserved lime kiln at the edge of the bay. 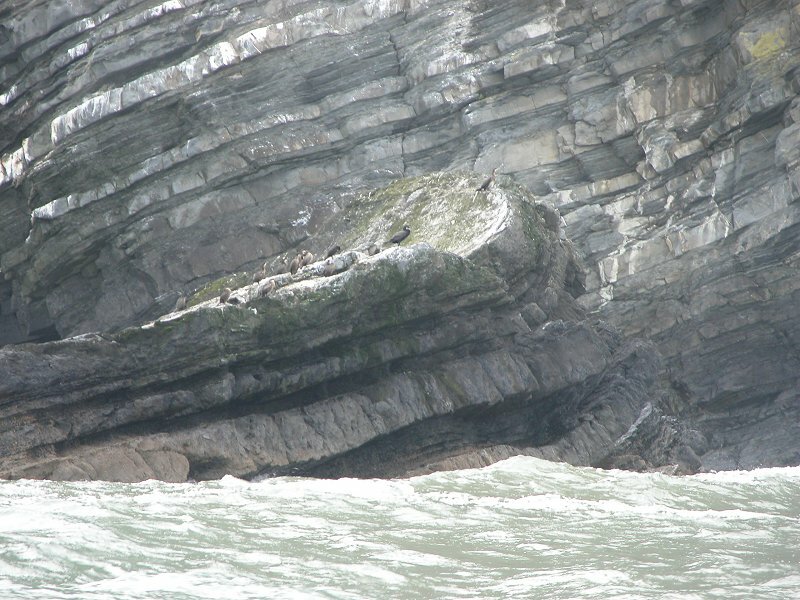 Cwmtudu is where a mother grey seal has chosen to rear her pups for the last few years. She is obviously close to pupping now, because she and a partner have been hanging around the shore, waiting for the moment to arive. 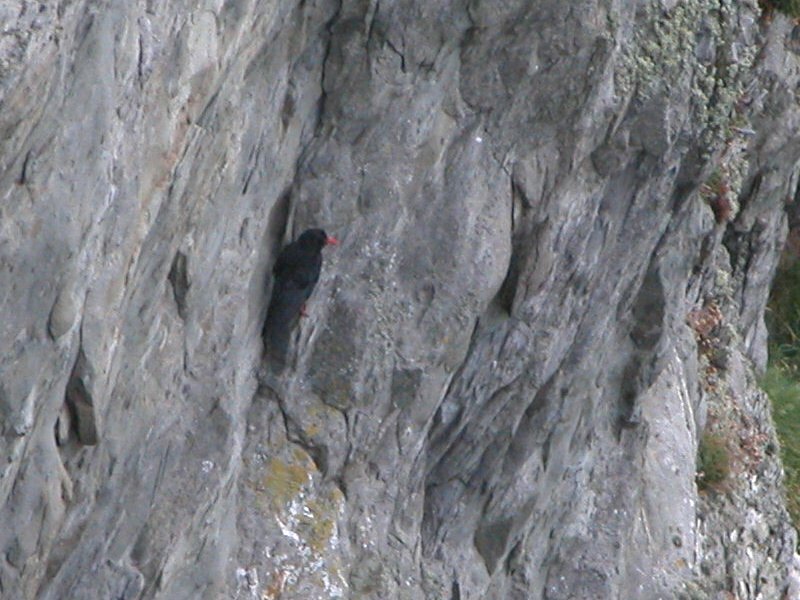 Another first for me, Cwmtudu is home to the red-billed choughs (basically a crow with red feet and a red bill). 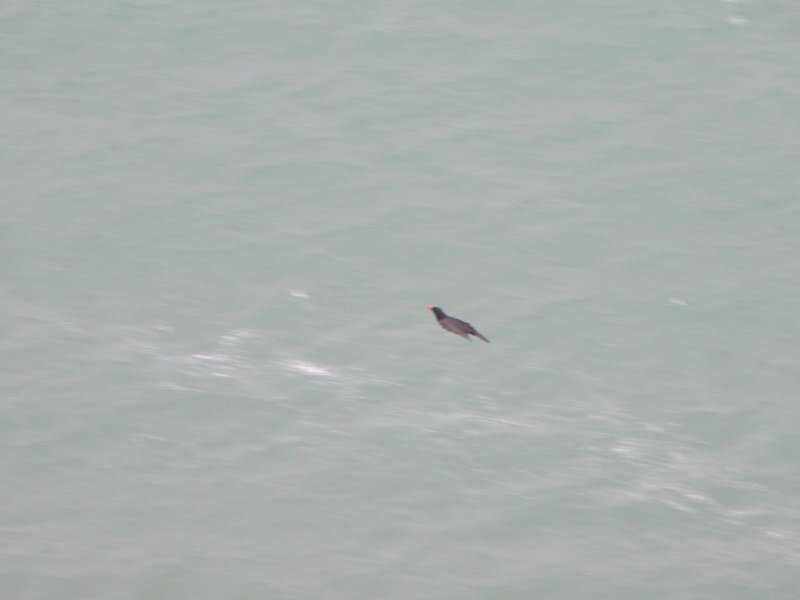 This particular subspecies is now a rare bird in the UK, so it's something quite special to be able to get a picture of one. And even more special to be able to get two pictures. Given how camera shy this one was, it took many, many attempts to get a picture that worked. 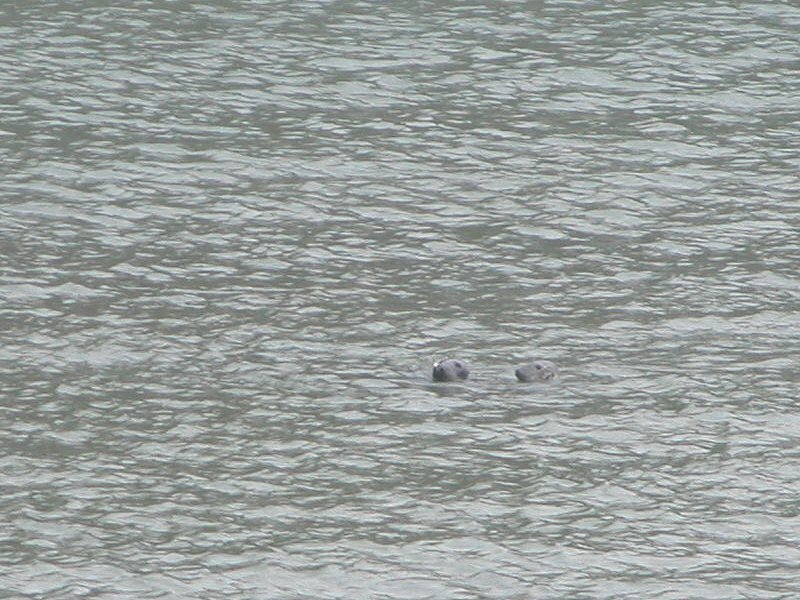 And still the seals were playing. 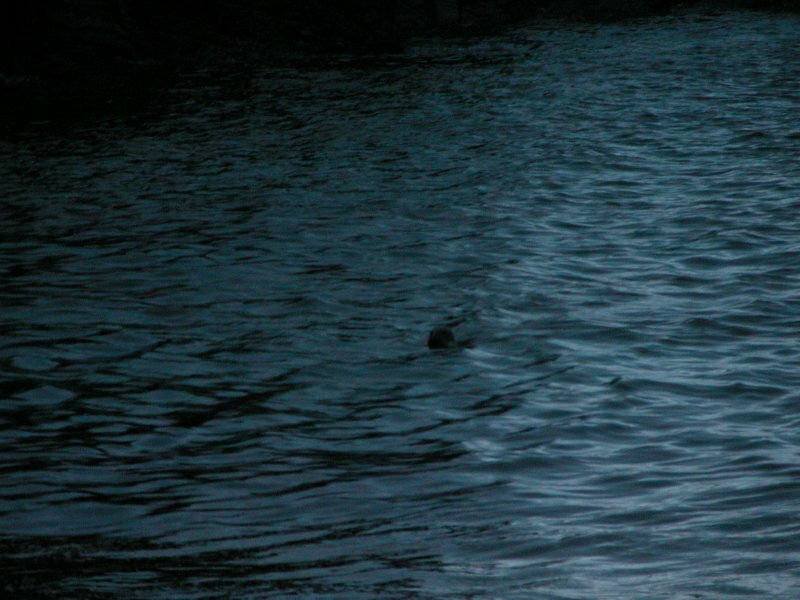 At night time, the seals were still there, sitting just off the shore, watching the humans watching the seal. 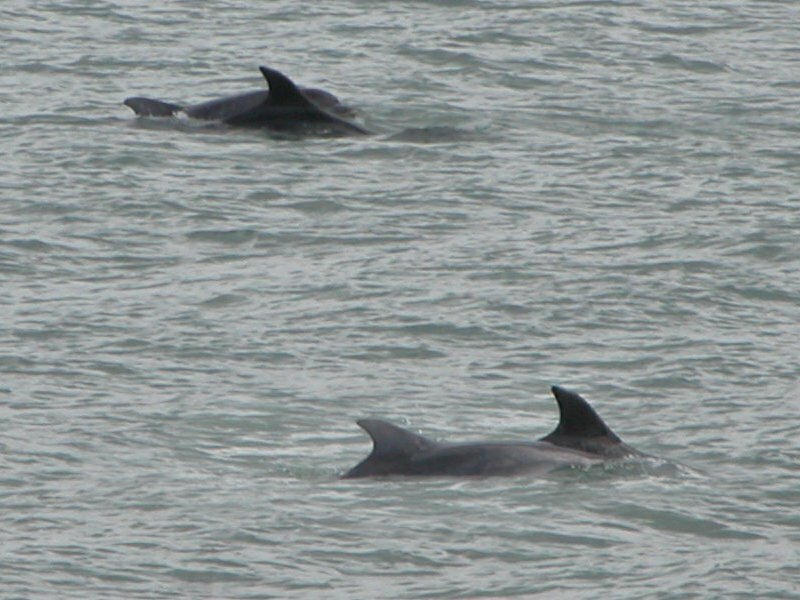 ... its resident family of bottlenose dolphins. 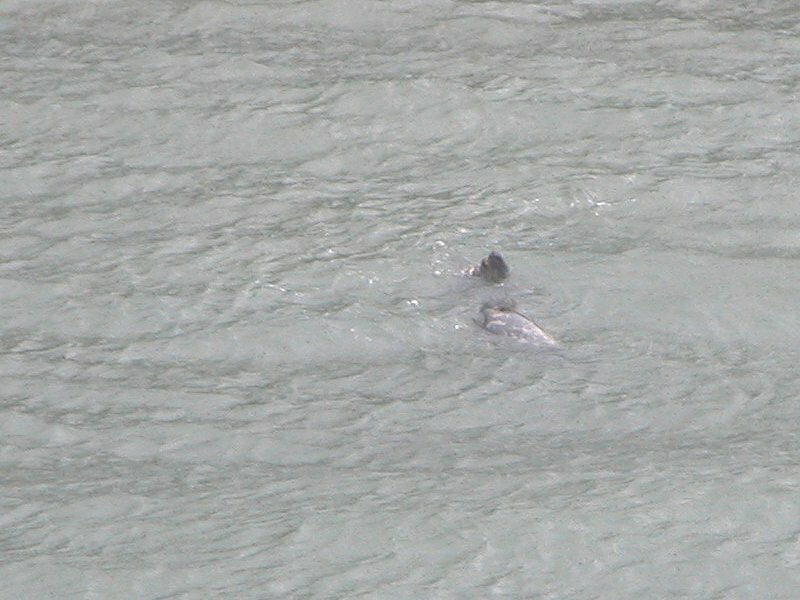 No sooner had we arrived, than we were treated to the sight of a mother and calf swimming together. They would come up for air about once every minute, and after seeing them, there was just 1 second to point the camera and take the picture. Prefocus, wait, point in hopefully the right direction, see them, repoint, press. Many times I just got splashes. Montage of the two best shots. 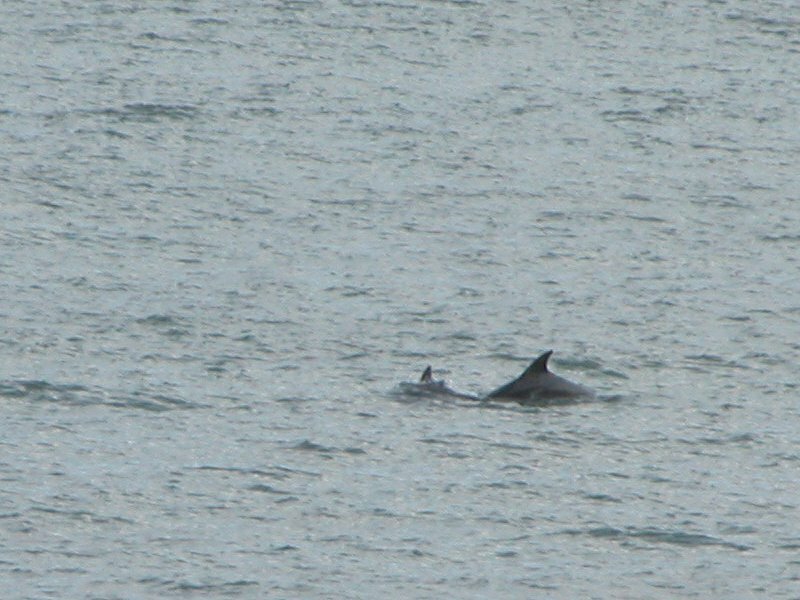 The two dolphins swam perfectly synchronised, so that for a long time, the pictures looked like they were of a single dolphin with two fins. Only in the final pictures do they look like separate animals. 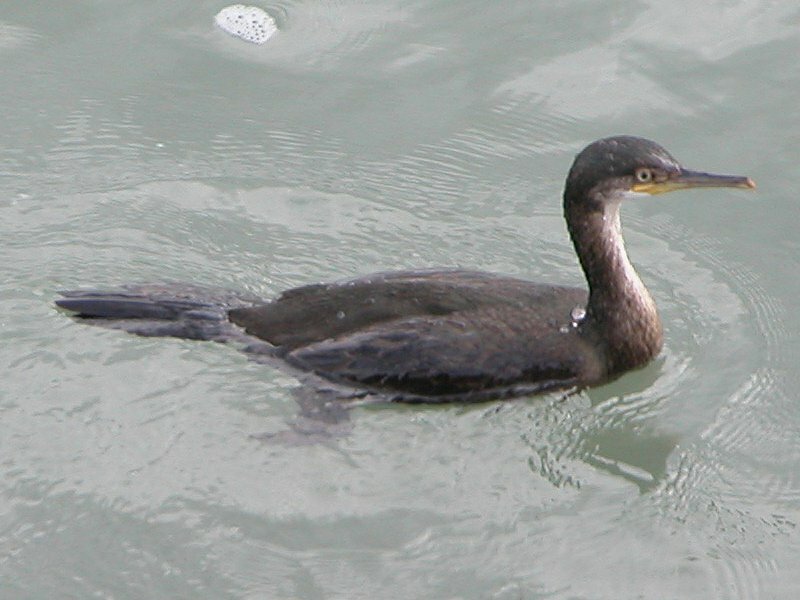 A cormorant keeps me company while I wait for the dolphins. 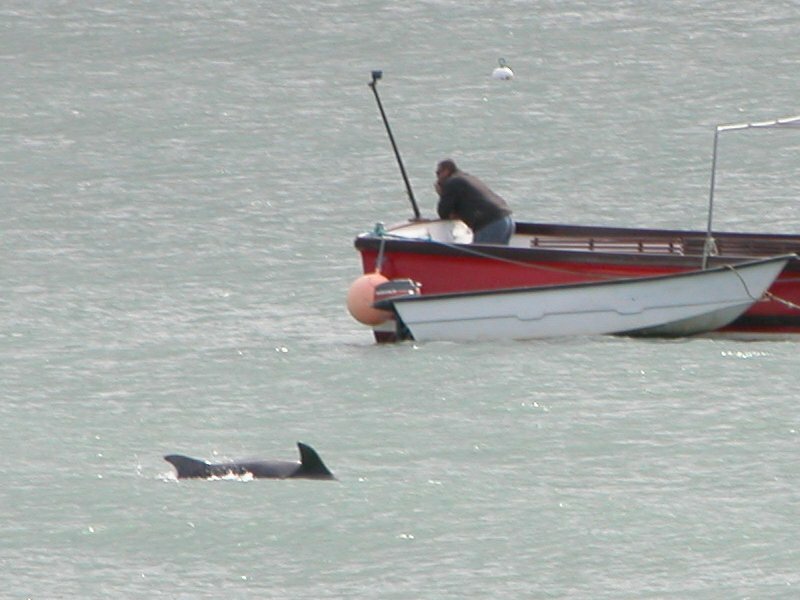 Swimming past - of all things - a dolphin-spotting boat. "It's behind you". There was a pod of 250 dolphins in the area, following the fish, so we took a boat trip to look for them - to get some of those classic shots of dolphins hopping and swimming around the boat. Nada. Sorry. Maybe next time. 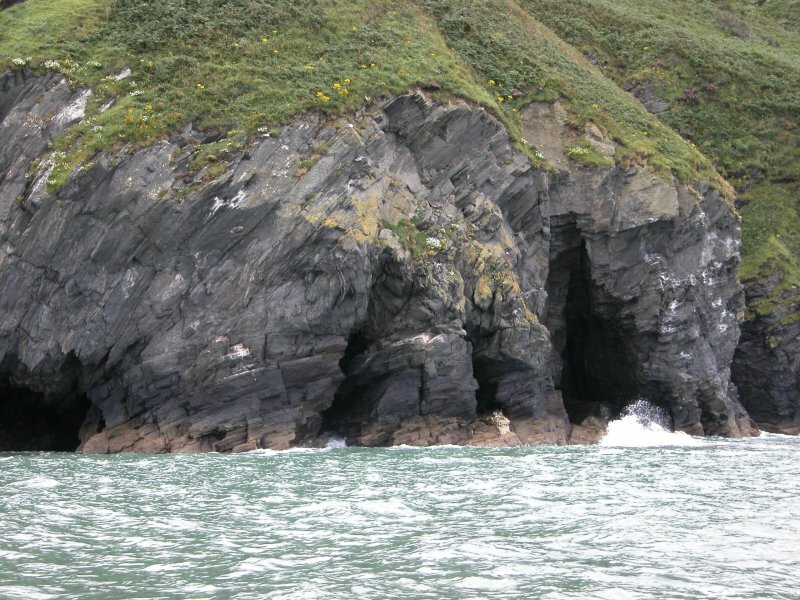 Sea caves near New Quay. 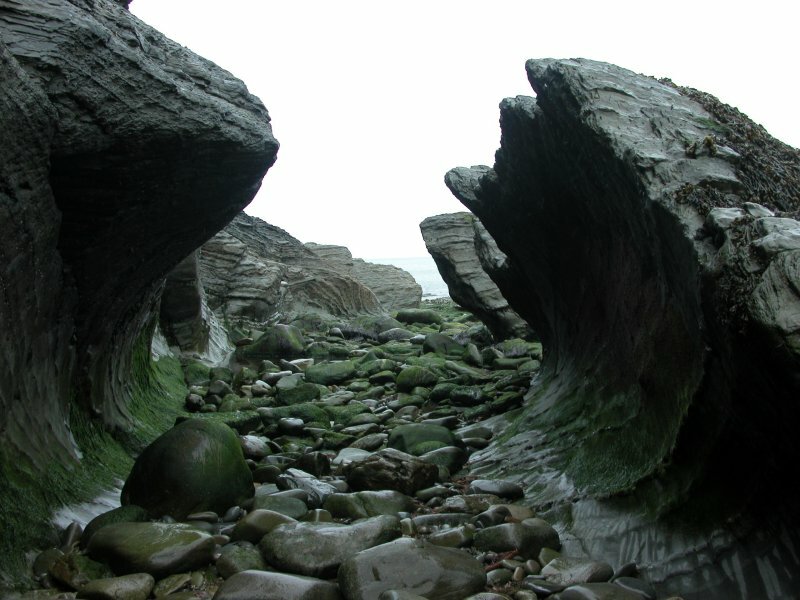 Rock beds. 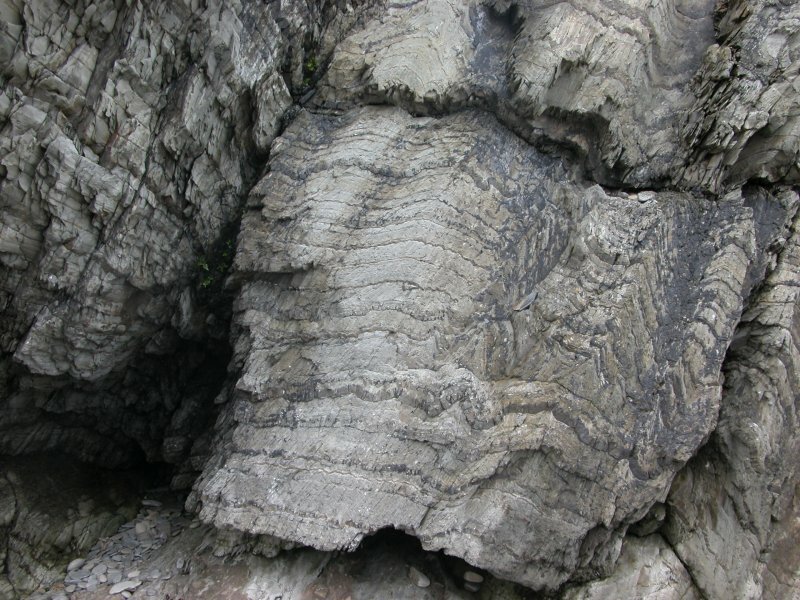 The rock here showed severe distortions, massive folds and twists, sometimes even rolling it around. 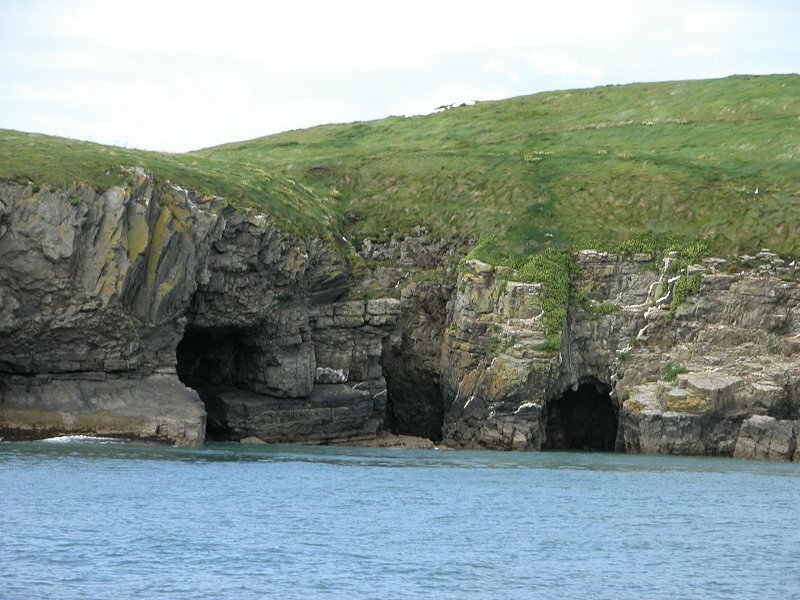 Sea caves at Trwyn Crou.